Erin Matzkin is the founder of Cluck Cluck App, which is an app that helps busy parents book, pay and message their children’s caregivers. What I like about Erin is that she doesn’t have a technical background, but she still managed to create an awesome app for parents. And it just goes to show that you don’t really need to know how to code in order to create a successful app. You just need to create the right team to do so. What’s a realistic time frame for creating a basic app. You are listening to the My Wife Quit her Job Podcast, where I bring in successful bootstrapped business owners to teach us what strategies are working and what strategies are not. Now this isn’t one of those podcast where we bring on famous entrepreneurs simply to celebrate their success. Instead I have them take us back to the very beginning and delve deeply into the exact strategies they used earlier on to gain traction for their businesses. Now if you enjoy this podcast please leave me a review on iTunes and enter my podcast contest where I’m giving away free one on one business consults every single month, for more information go to Mywifequitherjob.com/contest. And if you are interested in starting your own online business, be sure to sign up for my free six day mini course, where I show you how my wife and I managed to make over 100k in profit in our first year of business. Go to www.mywifequiteherjob.com for more information. Now before I begin I just want to give a quick a shout out to this episode’s sponsor Bigcommerce. Now Bigcommerce is a fully hosted shopping cart platform that allows you to set up your own online store in minutes. And as most of you probably know, I teach a class on how to start a profitable online store, and Bigcommerce is actually one of the shopping carts that I highly recommend in my class. Now here is what I like about Bigcommerce. Unlike other competing platforms, Bigcommerce doesn’t really nickel and dime you with every little shopping cart feature. And when you sign up, you immediately have a fully featured and extremely powerful shopping cart at your disposal. Now there’s also an incredible theme store where you can choose from a variety of attractive store designs, so you don’t really need a designer. And they also offer integration with Alibaba which is new, so you can easily find products to sell online. Now if you are interested in starting your own online store using Bigcommerce is as bad as easy as it gets. Everything from design, to payment processing is all built in, and you just have to populate it with your own products. Steve: Welcome to the My Wife Quit her Job podcast. Today I’m happy to have Erin Matzkin on the show. 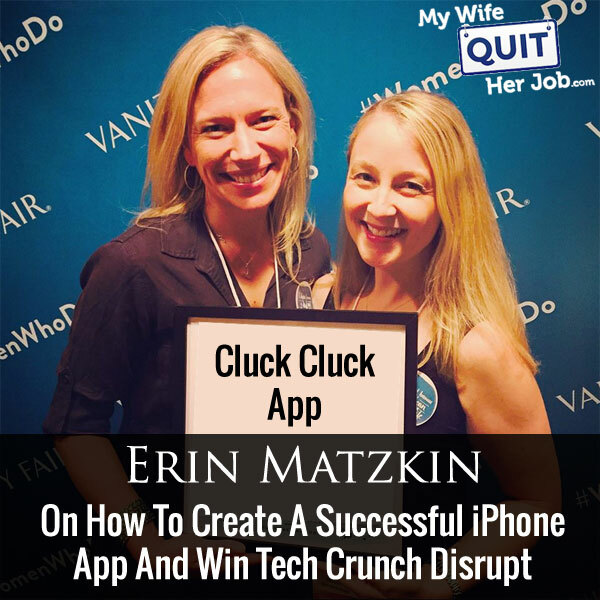 Now Erin along with her partners Heather Porter Joyce and Damian Toohey are the creators of the popular iPhone app, CluckCluck app which helps organize and simplify communication between parents and their kid’s care givers. Now what I like about Erin is that she’s a very caring mom who wants the best for her children. And as a mom she had a problem and came up with a very clever solution to solve using technology. Now her app has been featured on TechCrunch, Business Insider, Real Simple as well as other high profile publications and it’s really something special. With that, welcome to the show Erin, really glad to have you on tonight. Erin: Thank you. I’m so glad to be here and thank you for that lovely introduction. Steve: Yeah. It’s a great app. I actually took some time to download it and fire it up. Steve: So give us the quick background story; tell us about the app, how it works, and how you came up with the idea? Erin: As you mentioned my cofounder, Heather– Heather and I have been friends for well over a decade. We are both technology lawyers by way of background, and we started work at the same law firm together and then we both worked together for many years at the Walt Disney Company at Disney Interactive which is their website– which is the part of the company that manages all of Disney’s website and mobile apps. So during this period of time, Heather and I– we got married, we had babies and we spent a lot of time together sort of discussing the challenges of work life balance. One thing that we talked about a lot was how difficult it can be as a working mom to kind of come home at the end of the day and just really have no idea about what went on with your kids. I mean– for a baby you are like did they get a nap, how many ounces did they have in the bottle? For a bigger kid you want to know like did their homework get done? And then we talked about sort of other babysitting challenges like getting a sitter for a Saturday night. Then one day I was with Heather and she was trying to book a baby sitter for her own birthday party so she could go to her own party. She was texting and driving which is terrible, texting all of her sitters to see if they could come over. Finally she said, “There has to be a better way to do this.” So the next morning after her birthday party I came over to her house. We were having coffee on her porch and we started hand drawing wireframes for what a mobile app would look like to sort of solve all of our child care problems. A week later, we were like. “This is a really good idea. We should get serious about this.” So we built some wire frames for real and then we were incredibly fortunate that our friend Damian was willing to do the coding for us, to engineer it and CluckCluck was born. Honestly we built it to solve our own problem. Steve: So exactly how does it work? If you can just walk us through a use model. Erin: Yeah, sure. So there are three main parts. The first is a booking engine. So you need a sitter for Saturday night. I personally have four people who I use on kind of a regular basis. So with the app you can send one invitation to all of your regular sitters at once. They indicate if they are available or not, and then you pick the one you want and book it. It will calendar for you and for the sitter and it will disappear for everybody else. Erin: Then kind of the main part of the app is what we would call the feed. So you can set up a little profile for each of your children with what you want to be notified about. That could be anything from again bottles or naps, for a baby to like sports practice or let’s say school gets out on Tuesday early, you could put that in their profile. And then give your babysitter access to this profiles while she is on the job, and just with quick one touch buttons she can give you updates on what’s going with your kids. So she can just say with one click school pick up is done, homework is done, baby’s nap is done. She’ll also have access to all of your family’s emergency contacts. So let’s say she takes your baby to the park to play, she’ll have all the information with her just in case something were to happen. And then the last piece is the payment engine. So you can pay your sitter through the app and keep the payment history in case you need to export it to excel, like if you pay nanny taxes for example. And that’s pretty much it in a nutshell. Steve: So in regards to– when the sitter hits the button you basically– there is no texting back and forth at that point. It’s just probably just one user interface where you look at to determine whether they’ve accomplished whatever you’ve setup for them to accomplish, right? Steve: That’s nice. So when you decided to design this app, did you have Damian this whole time or were you kind of worried about the technical challenges of developing an app in the beginning? Erin: We were definitely worried about the technical challenges. Heather and I do not code ourselves. I wish I did. In my next life I will be an engineer. But we are– again we are tech lawyers and so we have helped various clients build many mobile apps, many websites. So we knew what that piece of the process should look like. So we were able to really sketch out a great level of detail, what the functionality would be. And once we finally got Damian on board– I’m not going to say coding was simple for him, but he had a clear road map for what it needed to be. Steve: So you mentioned wire-framing a lot. So that’s terminology that only someone who is kind of experienced would use that sort of term. So were you developing apps in your job or? Erin: Well no, I was helping. So when I worked at Disney, I would help the Disney business team to develop and build apps. Steve: Okay. So for the listeners who don’t know exactly what a wireframe is, if you can just kind of describe that process that you went through, that would be great. Erin: Yeah. It’s– pardon me for using weirdo technology terms. It basically just means like a graph of the app. So you create a step by step map of what it will look. So if you touch this button here, you will get a picture showing this is what the user will see next. So it’s just very clear what the flow will be as the user is working their way through the app. It’s not a difficult process but it can be complicated. You just want to make sure people don’t get trapped somewhere in a dead end and [inaudible] [0:08:54] whatever piece of the app they need to use next. Steve: So do you use software for this or did you just do it on a piece of paper? Erin: You can do it either way. We did a lot of it sort of by hand at first and then once we had it locked down we built it more formally with programming. Steve: So have you used any tools like Balsamiq or any of those tools to wire frame the app? Erin: No, not me personally. Steve: And then how did you find Damian? Erin: This is just– honestly just luck, the stars aligned. We had actually started out with a big development shop was our– they were our first partner and they were great. I will say that they were a lot of young guys who did not have children themselves. And as fantastic as they were I think they couldn’t really wrap their heads around what we were trying to do. So after a few months with them, when it became clear that relationship wasn’t going to be productive, we parted amicably. About a week later, a friend of mine introduced me to Damian. Damian has three kids and it was like you could see the light bulb turn on. He got it immediately. And he was really enthusiastic about it, and has just found a fantastic partner. Damian is a natural rocket scientist, he teaches– he does aerospace engineering, he teaches classes in engineering and he’s the LA, he’s brilliant, and we are so lucky to have him. Steve: So are you guys all doing this on the side? Then Damian this is side job for him? Steve: Okay. And he has three kids, and he’s a rocket scientist. Steve: Okay. And he had time to code this up. Erin: I think he doesn’t sleep, I think [inaudible] [0:10:33]. Erin: That was through a friend of mine recommended this company. Erin: Former coworker of mine recommended the company. Steve: Okay, and then as you were wire-framing your app, was there some sort of validation process that you went through before you all decided to kind of go all in on this project? Erin: Actually not really. Damian was able to get a Beta app and running for us with a lightning speed. And once he had the beta app, we honestly, we sort of pressed our family and friends, and [Inaudible] [00:11:09] and we had a couple of hundred people, our friends and family tested out for us. And that was really the validation we made, several edits to the app as a result of that process before we publically launched it on iTunes. Steve: Okay, so your Beta testers were mainly friends and family? Steve: Okay and how quickly did you get the Beta version out? Erin: I want to say from the time we started working with Damian, maybe four months, and again remember he was sort of doing this on nights and weekends. Steve: Okay, I was just curious, were you getting feedback along the way as you were developing that first Beta or was the first Beta just based on ideas that you guys just the three of you had talked about? Erin: It was really just the three of us at that point. Steve: Okay, and then once you started testing, or once you had Beta customers, did you guys make a lot of changes at that point, and what was the process by which you actually took feedback, because I have experienced developing software as well, and often times you get all sorts of feedback, and some of it might not jell with your overall vision for the app, so what was the process by which you kind of processed the feedback. Erin: It’s a really good question. First of all we could see the path of the app where people are really engaging, and some things that weren’t being so utilized, so we knew where to focus our efforts. And I would say I think to some degree we were just lucky, we had friends and family who were pretty candid with us, and gave us some really excellent points of suggested functionality we had never considered, there was a lot of work around the calendar and piece in particular, around being able to blast one invitation to all of your sitters, and pick the one you wanted. And so that function– we scrapped that whole thing and started over based on feedback that was– it was not friendly enough. And then we added some additional functionality, like the payment history and there is a time also you can have your set of clock in and out, when she starts and stops of her work, so you know how much you owe her. Those were things that were entirely suggested to us by our users. I do agree with you we received some feedback with which we didn’t agree, we didn’t feel like it was really going to work with our central purpose of the app, with our vision of the app. So there were some things that we considered carefully and discarded. But by and large the feedback that we received during Beta was really helpful. Steve: And then why your app was in Beta, was it on iTunes for everyone to download, or was it just kind of a private Beta. Erin: It was a private Beta, we used [inaudible] [0:13:43] which is the modern test flight, so you can just blast your app, only to people you want to have access to it. Steve: Okay and then how long it was in Beta before you actually decided to put on iTunes. Erin: I don’t remember exactly, it was a few months of testing. Steve: Okay, and then once you decided to put it on iTunes, what was kind of your launch strategy? Erin: Well, we are a small start up, we are bootstrapped, and candidly we were trying to get as much organic press as we could, because we did not have a gigantic marketing budget to spend. So we had then kind of cultivating relationships with a few recorders during the Beta process. And we’re incredibly lucky to have TechCrunch cover our launch, which was amazing. That was amazing. Steve: So, let’s delve deeper into that, how do you TechCrunch to cover your launch? Erin: So, my partner Heather who is braver than me, and cooler than me, she without time she applied for us to be in a TechCrunch pitch off, I don’t know if you are familiar with this or not. Steve: Okay, no I follow TechCrunch for sure, I didn’t know that they have pitch offs. Erin: They do, they have regional pitch competitions, where basically they take you usually five to ten companies, they give you literally one minute to pitch your company, and then the winners get tickets to TechCrunch Disrupt which is their big conference. Steve: Yes, yes. I’m familiar with Disrupt, yes. Erin: Yeah, so Heather applied for us to be in a pitch off and we ended up winning one of the prizes and getting a booth at Disrupt, in their start up early, and we just– we met a ton of really interesting and fun people, but also met a couple of reporters who offered to cover our launch, and in fact came through for us when we were ready to launch. Steve: Wow. Okay. And so was that the magazine Real Simple on business insider or with these other people? Erin: I will tell you, I think we were very lucky to get the coverage from TechCrunch because a lot of the other publicity start from there. The pickups from business insider and battle, and some of the other apps, Mommy press, I believe– I don’t know for sure, but I believe they probably came at that because people saw the TechCrunch article. Steve: Okay, and then just hypothetically speaking, let’s say you did not win that TechCrunch pitch, what was some of the other things that you had in mind, like what was plan B and C and D? Erin: I think you gave me a credit for being more organized when I answer. We were prepared to work with the PR Company, with a PR firm if we needed to. Steve: Okay. Do you guys work with one now, I mean how do you get publicity today? Erin: We do not work with one now, we do a lot of blogging and a lot of social media, and that gets us a fair amount of traffic. In a perfect world if we were– if we had decided to pursue VC money or something like that, I think we probably would be working with a PR firm, but we are really enjoying kind of this organically grown business, it’s been a lot of fun for us, it’s been a great adventure. Erin: You run a great blog. Erin: No, it’s tied to the app; you can access that from the app web page. Steve: Okay, So let’s talk about your content strategy, so what are some of things that you write about, and how does that tie into your app? Erin: Well, we have found that the demographic who’s most humbly using our app is working mums. Erin: Surprise, surprise which makes a lot of them, so we try to blog and write honestly about issues that we ourselves have tackled as working mums, whether it’s suggestions for how to make your day a little easier, or just want empathy for hey this is tough, we’ve been there, you are going to get through it. We blog about a lot of issues, about work and family. Steve: So, having started a blog myself, I know that in the very beginning it’s pretty lonely when no one is reading, so how did you start that initial traffic burst with your blog? Erin: That and the second question, Heather and I each wrote a blog, so we did blogging for a little while and it’s kind of what you are talking about, we are so alone in here, and no one’s reading it. And then each of us wrote a post that was very honest, mine was about why I had quit my big corporate job to become– to go freelance. In addition to the app, I’m also an attorney and I run my own small practice. So I wrote a post about why I had quit my big corporate job, how difficult it has been for me, and how candidly I was still mad that I had to quit, and that kind of turn the traffic. And then Heather wrote a post about her experience, she at one point had quit her job to be a stay-at-home mum, and after several years at home returned to work force. And she talked very honestly about what an incredibly difficult transition that had been for her, and how off ramping, you’re taking time off to stay at home can be more detrimental to your career than people generally will admit in the media. And those two posts together somehow managed to drive a fair amount of traffic to our website. We still get head time results all the time. Steve: How did you get the word about those articles? Erin: We posted those articles in addition to like our CluckCluck social media accounts, we posted them to our personal social media accounts which links back, and the traffic all came from there. Steve: Okay and how did you build– is this from Facebook, or twitter, what are your main social media outlets? Erin: Our main social media outlets are Facebook, Twitter, and Instagram. Steve: Okay, so let’s talk about all those actually, let’s talk about Facebook first. How did you build your Facebook fan page? Erin: Well, Facebook is a tricky one, right. Facebook– I’m going to get all boring a lawyer, I get away from that. Facebook has changed the way the algorithm works, so that posts by companies are becoming less and less obvious in your news feed, and so I think we rely less and less on Facebook, simply because it is not driving traffic that it used to. Steve: Okay, so what do you focus on then? Erin: I mostly use Instagram more than anything which is funny because our app is not naturally a super visual piece of media. And so we try to post a lot both serious posts and funny posts on Instagram about challenges of being parents or working parents. Steve: I actually– I was just about to say your app is perfect for Instagram, because you can post all these funny things about your kids and your family. So do you get kind of personal on your Instagram account? I know my wife doesn’t like me posting pictures of my kids on my account. Are you guys wide open with that? Erin: We do not post pictures of our children. I will certainly post pictures of the aftermath of our children. My son broke the window this afternoon; I posted a picture of the broken window. Steve: So how do you mix Instagram posts with kind of more with posts that encourage people to check out your app. Erin: That has been– it’s a challenging one, because you want your audience to be entertained but you also want them to know about your product. I really love our product and I believe in our product. I just think we try to keep it a fine mix of like “Hey these are funny relatable moments that we’ve had as working parents.” And then we usually– we will post a photo about one of our latest no– let me give you an example. We did it a post about going back to work after maternity leave and we found this great shot of this really gorgeous woman, who look professionally dressed. And so we’ll post something like that with a link back to the blog in the profile section. Steve: So by link– because Instagram doesn’t allow links, so is it just like the typed out URL? Erin: So what we do in your Instagram profile, you can– there’s one live link. And we update that link constantly with whatever our new blog post is. Steve: I see so you make the post and then you say “link in profile” or something like that, right? Steve: And so how do you measure all these– how do you measure what’s coming in from Instagram and– do you guys measure where all of your downloads are coming from? Like the sources? Erin: It’s hard to measure downloads. We are iTunes only. We are IOS only right now. We are working on an android version, but it is not up and running yet. So it’s hard to tell what brought somebody to iTunes. It’s relatively easy to tell where web-traffic to our website is coming from. And we do use like a Google URL shortener for twitter, for Instagram and so sometimes it’s hard to tell something has come from a Google search or from a URL shortener. Yeah there are many tools available that will tell you where your traffic is coming from. Steve: So would you say that Instagram is one of your primary sources outside of your blog? Erin: Yes. Facebook [inaudible] [00:22:44] a fair amount of traffic, but we have kind of seen that go down over the past six months and I expect it will continue to go down. Steve: Okay, and then what are some of your strategies to get more Instagram followers. Erin: I do not have any good strategies. Do you have any you would like to share with me? Steve: Maybe I’ll find. I mean I’ve interviewed some people who base their businesses on Instagram. So I was just curious if you are doing anything special to get more ads. But I mean in a nutshell a lot of these people that build their following, they run contests, they do giveaways and that sort of thing. Erin: You know we keep talking about that. We probably ought to get more sophisticated about it and do more about it, but right now no we haven’t tried any of those tactics. Steve: Do you guys do anything paid advertising? Erin: A little bit. We kind of dabbled to see what moves the middle. But I will tell you in terms of app downloads, the paid ads don’t seem to work as well as just some of the press coverage we’ve gotten. Steve: Absolutely. So what is your– so you don’t have a PR firm, so how do you do your outreach today for press? Erin: Oh boy! It’s– we try to be strategic about once a month. We look at our media plan and update it. But it’s really a lot of organic outreach; it’s me and Heather emailing editors, calling people, trying to let them know about the app. Steve: So are these just editors that you know or they are just brand new cold call editors. Erin: It’s a combination of both. It’s a lot of cold call quality emails though. Steve: Okay, and do you guys use the service like Harrell or anything like that? Erin: We don’t. We haven’t. I know some people have great luck with it, not us. Steve: Yeah I mean you have to be like the first person to respond. Basically– I mean it’s been hit or miss for me, but I was just curious. So I had another question actually and this is just about the app, why did you decide to price it at 99 cents as opposed to giving it away for free with advertising? What were some of the thought process behind that? Erin: You know we thought about that a lot and we played with several different models. But this was a big part of our beta test was how– what is the best way to sell it? What do people feel is the best value? And you know free with ads is not a great business model for most apps these days. It’s just that the ads– I think that there will be a great way to monetize mobile, but just banner ads and apps doesn’t tend to really get it done unless you are gigantic, unless you are a huge app. And also kind of we’ve used a bunch of apps without them and some of them don’t just look that great. It interferes with ease of use. Erin: And we decided we really wanted this to be a clean and simple tool for parents and for baby sitters. And the keeping it ad free was the better way to go. Steve: Did you guys run any tests to see whether it would generate more income than the download? Erin: We– yes we did. And we believe that the download model works better for us financially as well. Steve: Okay. Just a side story there is this pay app that I let my kids play but it’s ad driven. And every now and then they will hit the ad which pisses me off because it takes them to the seller website. Anyway, okay so let’s see– so now your app is on iTunes, what is the secret to getting visibility on iTunes? Erin: That is– it’s really tricky. There are definite strategies to making your app more visible. If it’s optimized for both iPhones and for an iPad, that will help you definitely apps that are so general orient app that don’t have any mature content on them, that’s a better way to go. And ours definitely doesn’t have mature content, it’s general audience. Having the app available– this is something we are working on; having it available in multiple languages can be helpful. That actually would– will be great when it’s up and running for our app as well because a fair number of our app users English is not their first language. Erin: Yeah. Apple is a little bit secretive. There are some strategies to getting your app more favorably placed. But it’s all a little bit of a guessing game I would say. Steve: So you didn’t do anything super special to kind of rank higher in the iTunes search algorithm? Erin: No, things like downloads matter. And I will tell you a lot of apps out there pay for downloads. They buy downloads so that their apps appear to be more popular. And that’s is something we have steered away from for a variety of reasons. Steve: Yes I know that there is companies in china where you just pay X number of dollars and you get like 5,000 downloads, a thousand down– it was actually just in TechCrunch I think, that article. It’s basically this person in front of like a thousand phones, like a huge warehouse array of these things and people are just downloading apps. Okay interesting. What about a strategy for getting reviews. Reviews probably help also, right? Steve: Yes I will go give it a review right after this interview. Erin: Oh thank you. That’s very kind of you. It’s actually funny enough that we are about to push an update the app-store, which I think it’s going to be a great update. But one of the things that we’ve done is made it easier for people to give reviews within the app, you don’t have to leave the app and go into the iTunes environment. You just prompt– you may have seen this. A lot of apps do this, Instagram is one of them. “Hey, would you like to give us a rating.” And for apps where there is royalty in use of attention, a lot of people will go ahead and volunteer to give the rating. Steve: Okay yeah that would definitely make it much easier because I don’t– I rarely use– going to iTunes and actually give a review, right? Erin: It’s not the easiest process. Steve: Yeah, I mean I have that same problem with this podcast right. If people have to go on the web or iTunes to leave a review generally they are not going to do it. I actually went as far as to bribe people. So I know that works if you want try that. Erin: Oh that’s good. That’s good [snore] I’m going to put that into our media plan. Steve: So this is kind of like a technical product. Do you guys actually have to deal with support? Erin: Yes we do. We do have to deal with support. I mean I will tell you the first version we thought we had beta tested it to death and after it had been live we found a small bug. So these things happen. Luckily again Damian is a genius. So he had a correction on that in about an hour. Steve: Really? But he still works full time? Erin: He does, it’s incredible. I don’t know how that man gets it all done; it’s very impressive, because we do get customer emails. “This isn’t working for me.” “Hey I thought this functionality was going to behave a little differently.” We just try to be really on top of that. We are not currently using a service. We are still doing that piece ourselves. Steve: Okay, do you guys have a phone line or is this all basically email support. Erin: No, it’s all email support. Steve: Okay and do you find that because customers pay 99 cents for an app they kind of demand that things get fixed quickly or what has been your experience with customer support? Erin: We’ve had a few customers who have taken out tact and felt that they either wanted to fix or they wanted their 99 cents back. But I will say most people have been pretty generous and not terribly demanding or mean with their feedback. Not really big with customers, we’ve been lucky so far. Steve: Okay, and then given that IOS kind of gets updated all the time, does Damian kind of maintain all the code for all the different versions? Erin: He does, I mean he uses his tool kit, yes, but he is a one man show pretty much, that’s correct. Steve: He is a one man show, wow, it sounds like I should get a hold of this guy and pay him double whatever you guys are paying him. Steve: Yeah, I know totally, I mean most apps these days have like a team of people working on them, right? Erin: Yes, that’s much more common, and that’s where we started, we started with the team. Steve: I mean the days are over where you could just put up some stupid floating app online to make a lot of money, right? Erin: Oh, I don’t know YO, was really popular last year. Steve: That’s true it was, that’s true. So let’s talk about pricing why did you settle on 99 cents? I know there is apps that are priced all across the board. Erin: We have played with the price a little bit. Erin: But 99 cents seems to be the sweet spot where customers are — I think most people are willing to do the 99 cents price point. There have been a lot of studies about apps on iTunes. And it seems that there is a drop off between 3 and 99 cents. And there’s a drop off between 99 cents and 2.99, and then a big drop off after 2.99, if you go any higher than that. But 99 cents is a really common price point on the apps store. A lot of people don’t like to pay for downloads, but they’ll consider the dollar. And that just seems to be the sweet spot for us. Steve: Okay, and did you guys experiment with some of the other price point? I was just curious what the fall off would be if you went to 2.99. Erin: We did, so we’ve made it free for a while, we’ve made it 2.99 for a while, to see how it moves the numbers. And I’ll tell you making it free — oh boy, I hope this isn’t like two tricks where Heather is going to get mad at me. But making it free actually does not result in a giant increase, making it 2.99 results in a big decrease. Steve: Okay, and so you guys gave it for free, but there was no ads, right? So there was free ones you weren’t making any money off of right? Erin: That’s correct, we’ve done it as like promos, hey we are going to be free for the next week, that kind of thing. Steve: Oh, okay, and in terms of that little payment part of your app. Do you guys take a cut of that at all or is it just…? Steve: Okay, so in a way that’s kind of internet monetization, right? Erin: That’s correct, that’s exactly right. Steve: So what carrier do you use to process credit card transactions in? Erin: Currently we only have a PayPal integration, and if you use our versions of the app that plan to roll out additional payment options. Erin: There’s only PayPal accounts, the PayPal functionality yeah. Steve: So they have an account and then do you need a special account? Like website’s pin and pro or anything like that in order to accept payments? Erin: No PayPal really handles the entire thing. At this point they can do the payment to the babysitter and then the tiny payment to us in parallel. Steve: Okay, and so you just need a very standard, very basic PayPal account in order for this work? Erin: Exactly right, nothing fancy, nothing special. Steve: Okay, and so what are some of these — what are some of the other — like because I didn’t even know that you are monetizing that part of it. Are there any other ways to make money with the app, like I kind of applied that one app? Erin: We have some plans to monetize the app in the future. Nothing I can talk about today though unfortunately I apologize for that. And nothing that [inaudible 00:34:14] to roll out and it comes in. I think that we are at least six months away from any different type of monetization beyond taking the convenience beyond the payments of babysitter. Steve: Okay, now I know a lot of listeners out there they are interested in developing apps for iPhone and android. One question I had was why did you start with Apple as opposed to android, given that android actually has a larger market share at this point? Erin: That’s a really good question; we did a fair amount of the research. And we had identified relatively online that really our demographic was primarily parents aged 25, to let’s say 45, with generally both parents working outside the home, vast majority of people who fall into that demographic are iPhone users. Steve: If you would just start all over again, could you kind of just walk me through the process that you would go through to create a successful app, as successful as your app has done. Erin: Oh, yeah, thank you. Yes, so I think the — probably the most important piece first of all is to be very clear in your vision for what the app would look like, how it should behave, because if you go to a developer let’s say you decide to hire a developer to build it for you, the more vague your idea is, the more expensive it is going to be to build. Because you are going to have to iterate more — there’s going to be a discovery process to really clarify that idea to the point where an engineer can do the coding for you. But if you could go down with it really — going with it really locked down on paper. So somebody could kind of walk and code, pick up your paper and understand the app, and how it should look and how it should work, you are going to save yourself a lot of time and pen. Steve: So is this as simple as just taking a piece of paper and saying hey, when someone clicks this button, it goes to this page and how the flow of the app works? Erin: Yes, I think it absolutely could be that simple. Steve: And what about — one thing I forgot to ask you about was graphics. Who does your graphic design for the app.? Erin: So my graphic designer is a fantastic woman named Kim. She is — actually I got to tell you this app was a Bourne [ph] racing at the beginning. Kim is the sister in law of one of my best childhood friends. And she was the graphic designer in Natal [ph] for a very long time. And now she works independently, she is freelance designer and she is amazing. So we — Heather and I are lawyers, we are lawyers by background, we are not super creative people, so sort of the logo and looking through was a challenge for us. So we got her in very early on and hired her to create our logo and to kind of give us some style guidelines for the app, and I think that has made a tremendous difference. Her work took our basic idea and she made it beautiful. And that’s a big deal when you’re using an app. You want it to be stylish, and you want it to be good looking on your phone, so full credit to Kim for that. Steve: So I’m just listening to all the different pieces that you need to come together for this app. It look like you need a coder, you need a graphics designer, and you needed two lawyers. So how much did you invest to get this app off its feet? Erin: Well, the funny thing about doing this is [Inaudible] [00:37:46] raising is we didn’t actually end up cutting the cheque. I will say we paid Kim for her graphic design help, but she probably gave us the friends and family rates. Erin: Damian came on as an equity partner, so we’re not paying him an hourly fee or anything along those lines. Erin: Yeah, so we have been able to keep ourselves pretty lean. Steve: Would you still have gone the equity partner way or would you have kind of paid lump sum, like that first firm that you used, did you pay them or was that an equity deal? Erin: Without going into great detail, it was more of an equity deal. We did not pay them. Steve: Okay, and so would you suggest that going forward for people who want to start their own apps and they’re not technical at all? Erin: I think yes. In my belief, the best thing to do is to find technical co-founders, to find your own Damian. And I do think those people are out there. They can be very difficult to find, but if you are serious about building a product that you want to have a high quality functioning product, the best thing you can do is to have somebody who is invested in it with you. And either– there are some services out there that help match technical co-founders with non technical co-founders. There’s a website called Founder2be, it’s like a match.com for startups, where you can kind of go find the missing piece of your startup. Erin: There are places you can go to try and meet engineers or whatever type of expertise you need. Steve: Okay, are you down in the Silicon Valley, are you? Erin: No, I live in Los Angeles. Erin: Actually Heather is based in Atlanta, but she’s back and forth to LA on a regular basis. And yes, Damien and I are both based in Los Angeles. Steve: So how much would you expect to invest in an app? Steve: What about from a different perspective. So you guys all work your job still, what about a time commitment? How much time would you guys say you devote to this app? Erin: A lot of time, a lot of time. I would say it’s [Inaudible] [00:40:27] flows. Right before it launched we were, all three of us, probably working 40 hours a week on it. Steve: In addition to your…. Erin: In addition to our day job. But then there are times where if we don’t have any updates, that we’re working on at the moment, no big press push, maybe it’s only ten hours a week. It really varies. Steve: Okay. And so where would you say you spend most of your time now that the app is actually launched? Erin: Now that the app is launched, we’re currently working on an update as well as working on Android, so that’s a fair amount of time. But marketing and PR is probably the bulk of it at the moment. Steve: Okay. And then how are the duties kind of divided between you and Heather? Erin: Heather and I are pretty much 50-50. And the great thing about having a co-founder like Heather is that we can both kind of pick up the spot for each other. If she’s having an insane week at her a day job, I can step it up and vice versa. Steve: Okay. And then Damian of course, then rockets will not get designed that week I guess. Steve: So this company is government related then I guess? Steve: Oh, okay, okay. And he’s down in LA? Steve: I think I know which company it is. Well that’s cool Erin, any other advice that you would give out to someone who’s interested in developing an app? Were there any books or anything that kind of gave you a head start? Erin: Not on the apps specifically. I’m a big fan of The Lean Startup, if you’re looking to start a business. I’m a huge fan of Ben Horowitz’s book, The Hard Thing About Hard Things, which is about both starting a company and then scaling it up to a big company. And he’s part of Andreessen Horowitz, the large venture capital firm, and man does he have some good advice. For me personally, I would say my best advice is just to persevere. A lot of small startups, a lot of app companies fail simply because the founders run out of steam and kind of give up. And Heather and Damian and I are pretty tenacious. I really attribute a lot of our success just being willing to beat our heads against the wall until something works. Steve: And it sounds like in terms of maintenance, maintaining this app does not cost that much money because you have the engineer and then you guys obviously are working on it yourself, but you don’t have any outside help that you’re paying at the moment, right? Erin: We do not. I think in my dream world if our app got gigantic, I’m sure we will at some point, yes. Sort of outsource or to insource, but currently it’s just us. Steve: Do you guys pay yourself a salary or just all the money kind of goes right back into the app? Erin: Right now all the money goes right back into the app. I could envision a day where we all might take a salary, but not yet. Steve: Okay, and then what is the realistic time frame that you would give for somebody who wants to create an app? Erin: Well, again I think it’s kind of very based on complexity and based on the talent and time that is there to be doing it, but honestly there’s phrase about the longer it takes to launch, the less likely it is to launch. And I think there is some truth there. You got to give yourself a few months to a year, but try not to go a whole lot longer than that. Steve: Okay and then you highly recommend doing some sort of beta right away as soon as you can, and then iterating on it? Erin: That has worked great for us. I loved that route. I know other people have done other things, but that was great for us. Steve: Okay. Well, great Erin. We’ve been chatting, believe it or not, for 40 minutes already. Erin: This is been really fun. Thank you again for having me. I very much appreciate it. Steve: And get more information that’d be great. Erin: So our website is www.cluckcluckapp.com, and you can find us on iTunes, if you just search for CluckCluckapp, like the noise the chicken makes. Steve: And what about your Instagram account and your twitter account? Erin: We’re @cluckcluckapp for both and same on Facebook, it’s just– search for CluckCluckapp and you’ll find us. Steve: Awesome Erin. Well, thanks a lot for coming on the show. I had a great time. Erin: Thank you, so did I. It was a pleasure. Steve: Hope you enjoyed that episode. What I like about Erin is that she doesn’t have a technical background, but she still managed to create an awesome app for parents. And it just goes to show that you don’t really need to know how to code in order to create a successful app. You just need to create the right team to do so. For more information about this episode go to MyWifeQuitHerJob.com/episode71, and if you enjoyed this episode, please got to iTunes and leave me a review because when you write me a review, it not only makes me feel proud, but it helps keep this podcast up in the ranks, so other people can use this information, find the show more easily and get awesome business advice from my guests. It’s also the best way to support the show. And please tell your friends because the greatest compliment that you can give me is to provide a referral to someone else either in person or to share it on the web. Now, as an added incentive, I’m always giving away free business consults to one lucky winner, every single month. For more information go to Mywifequitherjob.com/contest, and if you’re interested in starting your own online business be sure to sign up for my free six day mini course, where I show you how my wife and I managed to make over a 100K in profit in our first year of business. Go to www.mywifequitherjob.com for more information. Once again I just want to thank Bigcommerce for sponsoring this episode. Bigcommerce is one of the best shopping carts that I recommend, if you want to start your own online store without having to worry about anything technical. They’ve got an incredible theme store where you can choose from a wide variety of attractive store designs, so you don’t need to hire a designer. And they also offer integration with Alibaba so you can easily find products to sell online. So bottom line, everything from design to sourcing to payment processing is all built in, and you just have to populate it with your own products. And you can literally start your store in a matter of hours. Simply go to www.bigcommerce.com/mywifequitherjob, sign up and you’ll instantly receive one month free. Once again the URL is www.bigcommerce.com/mywifequitherjob, thanks for listening. HI great podcast. but why no android app??? question: How come they end up putting all the money back into this app? It sounds like they have almost no costs. The developer is getting equity, doing support and service, and they paid out the designer for graphics. What else is there to pay?